What better way to spend a beautiful, warm, sunny Sunday afternoon than to take a tour on the Riverboat Discovery. Our first stop was at the kennels of late Iditarod Champion, Susan Butcher, for a sled dog demonstration. Susan won the Iditarod sled race four times and passed away from leukemia in 2006. The boat docked at an Athabascan Indian Village where two native tour guides showed us what life was like in the village. Our tour guides in the village were great. Imagine modeling that fur in 80 degree weather! 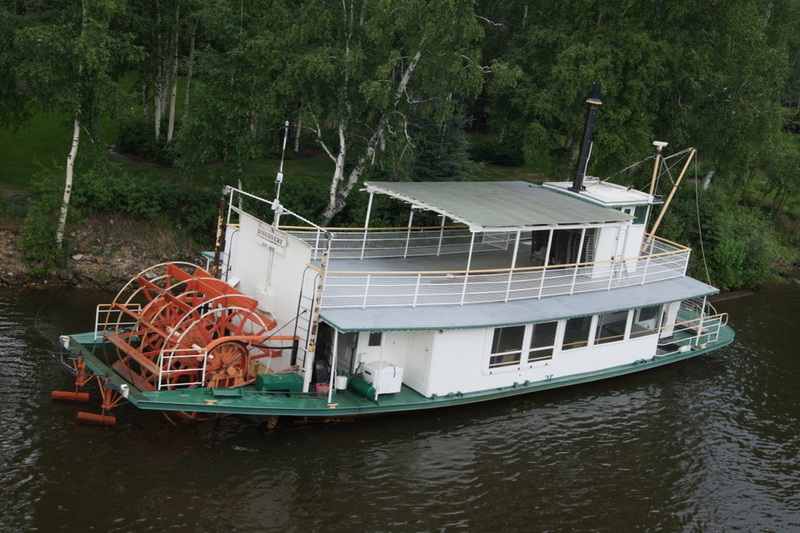 The same family has been operating cruises on the river for many years. We passed by the original Riverboat. Ted and Ruth Ann, our friends from Michigan who we were with in Haines, arrived at our RV Park yesterday. They left Haines after we did and traveled a different route to get here. It was good to visit with them again this morning. Tell Henry to buy a Grizzly Bear skin to wear to the National Championship football game at Rose Bowl next year! Happy 4th of July! You are experiencing Freedom in style!